Standard driers have the sight glass window and the connection for the storage tank at the top of the drier. Low window driers ( - LW behind model number) have the sight glass and the connection for the storage tank at the bottom of the driers. See Technical drawings and Installation drawings. Fill the DRIERITE® Vent Drier to just above the sight glass window with 4 mesh Du-Cal DRIERITE®. Then hollow out a small pocket behind the window and place a few ounces of 4 mesh Indicating DRIERITE® against the window. Quickly fill the tower with Du-Cal DRIERITE® to a point 1 inch below the top outlet connection. 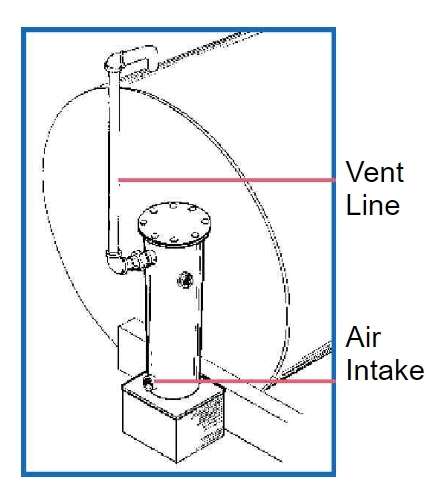 The upper connection of the drier is the outlet on standard driers and is connected to the storage tank through a vent line using a union or a flange.